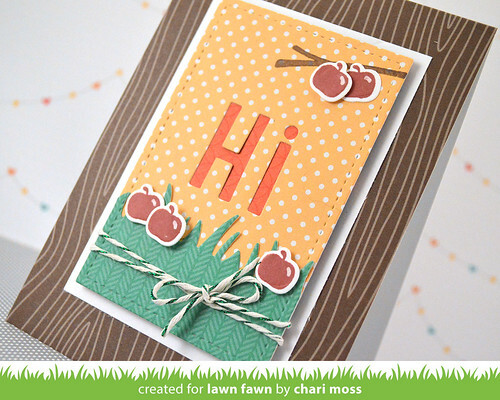 I'm back with some more inspiration for Lawn Fawn Inspiration Week! Today I have a project with Finley's ABCs. I love the size and the font of this die set. The letters are die cut out of the yellow paper leaving the negative space for the orange paper to show through. I used the Sweater Weather paper and the little apple from the Sweater Weather stamp set. I love the brown woodgrain card base with this design. Be sure to stop by the Lawn Fawn blog for more projects with Finley's ABCs, Finley's 123s as well as Violet's ABCs. Thanks for stopping by today! So cute! I love those dies and the colors on this card are perfect for the season. I love the size too! It's nice when you can use a word with more than a few letters with this die set. 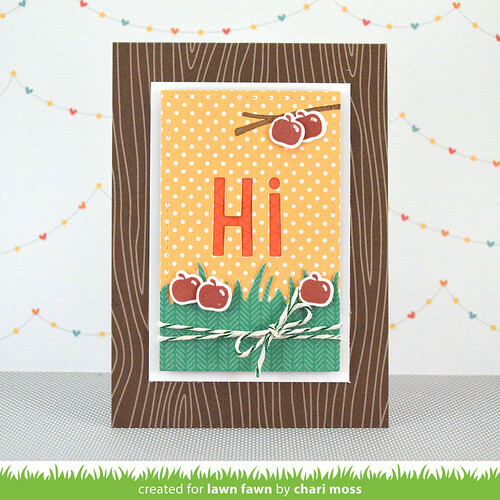 Really pretty card and I like the patterned paper used for the grass. Just love this card. perfect for a cute pick me up for a friend! Such cuteness! Love the color combinations and how you used the negative space. Love how you highlighted the letters using negative space, gorgeous!! What a great fall card!